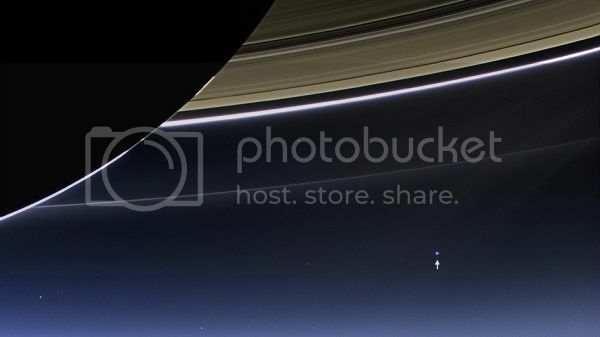 The Golden Thread - View topic - OK, everybody, wave at Saturn! OK, everybody, wave at Saturn! (CNN) -- As far as we know, there are no Saturnians on Saturn. There are no sirens on Titan nor large, monolithic stargates floating just outside Iapetus. And even if there were, they couldn't see us. Not in much detail, anyway. We're more than a billion kilometers away. But we're going to wave and smile at them anyway. At least, that's the plan hatched by NASA and "The Day the Earth Smiled," organized by Cassini Imaging Team Leader Carolyn Porco. On Friday, the Cassini-Huygens spacecraft -- serving humanity since 1997 and in orbit around the ringed giant since 2004 -- will take pictures of Saturn and its rings during a solar eclipse. Included in the images, though just the barest dot, will be our Big Blue Marble. "I hope, at the appropriate time, that you stop what you're doing, go outside, gather together with friends and family ... and marvel at your own existence and that of all life on planet Earth," she writes on her website. "Then, by all means, rejoice!" NASA has a catchier name for the image shoot. The agency is calling it "The First Interplanetary Photobomb." The Jet Propulsion Laboratory is asking viewers to "wave at Saturn." Is there an astronomical point to such celebrating? Well, NASA points out, it's not like Earth is often photographed from the far reaches of outer space. "Opportunities to image Earth from the outer solar system are rare," the agency says in its "Photobomb" press release. "Since the Space Age began, there have been only two images of Earth from the outer solar system." And maybe the point should be more existential, anyway. On Saturday, we'll celebrate the 44th anniversary of the Apollo 11 moon landing. Re: OK, everybody, wave at Saturn! I check this guy's channel most every day, mainly for updates on the sun's activities. Here it is epo! What an amazing shot!!! I'm going to give Saturn my middle finger for now!! Awww, gt! They can't help it! It's not Saturn's fault, surely. Anything that lovely can't be all bad. It's the tenants I was referring too. Everyone knows what happens to bad tenants......eviction notices are given!